Rep. 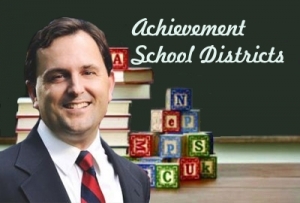 Rob Bryan, a Republican from Charlotte and one of the primary backers of achievement school districts. With state House lawmakers today expected to consider House Bill 1080, which would legalize a controversial, charter takeover of struggling public schools, it appears one outside group with ties to ALEC is willing to spend to push the legislation in North Carolina. Today, readers of The News & Observer might have spotted a full-page ad on page 8A calling for legislators to pass the bill, paid for by a little-known group calling itself the Education Freedom Alliance, based in Oklahoma. “Too many schools are consistently failing our students,” the ad reads. “House Bill 1080 will reform these schools, helping the kids who are trapped in them. The advertising leaves out the most controversial parts of the bill, particularly a component that would allow state officials to forcibly turn over management—including hiring and firing powers—of a handful of low-performing schools to for-profit, charter operators. According to the N&O‘s advertising department, full-page, political ads like the one that ran in today’s paper cost more than $8,000. Former Policy Watch reporter Sarah Ovaska-Few wrote last year that lobbying for the legislation was financed by John Bryan, a wealthy, school-choice backer from Oregon whose Challenge Foundation runs 10 charters in North Carolina. Its leadership also has deep ties to the conservative, school-choice movement. Board of directors member Jonathan Butcher is the education director for a right-wing, Arizona think-tank, the Goldwater Institute. And, according to ALEC’s website, Butcher sits on an education task force for the controversial, right-wing legislation factory, which is behind droves of conservative state bills, including pushes for school privatization, voter ID reforms, deregulation of the energy industry and state attempts to defang Obamacare. The board also includes C. Philip Byers, a former sheriff in Rutherford County who’s heavily involved with the Challenge Foundation’s schools—Thomas Jefferson Classical Academy and Lake Lure Classical Academy—in Cleveland and Rutherford counties, respectively. Ovaska-Few also wrote on the controversies surrounding both publicly-funded charters. At Thomas Jefferson Classical, students were participating in annual diaper drives for a local anti-abortion group, and at Lake Lure, school leaders once nixed all clubs after students attempted to launch an LGBTQ-friendly group. Lake Lure school leaders, following media coverage, eventually backed off on that decision. Today’s discussion of House Bill 1080 on the chamber floor is expected to be heated. Stay tuned to Policy Watch for updates. This group is also running radio ads in support of HB1080 on 106FM.